This is what I see when I get out of the car at the box in the morning. Not impressive, is it? 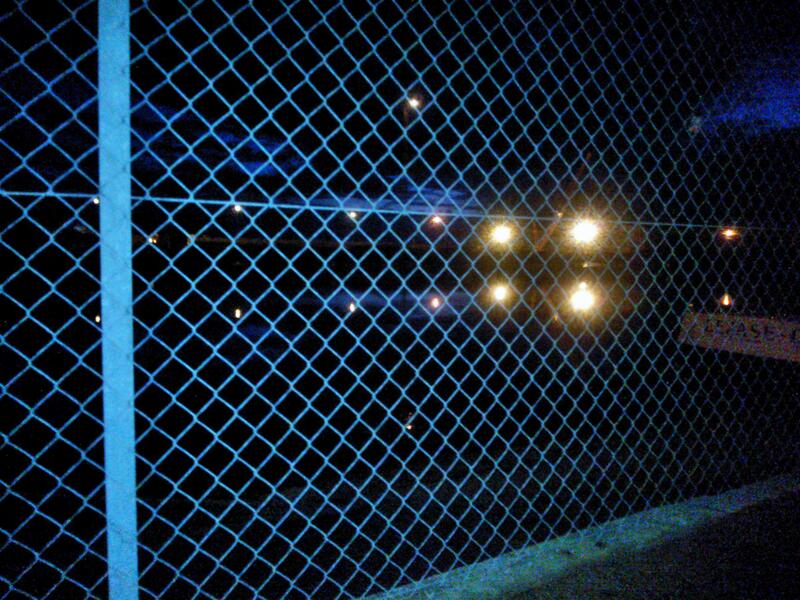 Still, what you can’t see in the dark is the houseboats moored along the other side of that chain link fence, the harbour basin as black as ink and the first light breaking through the winter clouds. 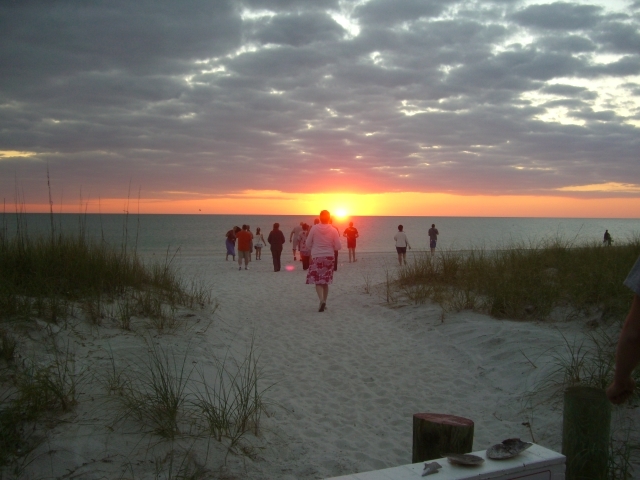 It’s great to start the WOD in the dark and to finish it with the sunrise striking the water. Just five of us for the first class of the day today, and I was the only female. Funny thing is, I didn’t notice that until we were jogging our warm-down at the end, and talking about ways of getting that all important first pull-up. Well, the guys were talking, I was listening, having a lot to learn and nothing to contribute to the discussion. I’m still doing 5 slow negative pull-ups every time I’m at the box, along with working on my hang grip. Today’s focus was 6×3 power cleans and I added another three collarbone bruises to the one I got from front squats on Monday, but that was okay because today’s WOD was front squats and pull-ups, so the bruises are probably just going to pretty well join up by tomorrow and give me a nice blue frontage to go up to town with. I can’t decide whether to wear a polo neck or show off the evidence of my honourable, but badly judged, endeavours! I used 20 kilos for the squats (the Rx for women was 30) and skinny purple and skinny red bands for the pull-ups. My time was 11:13 – last as usual but I don’t care. I only had to dump my bar once in the squats, when I got to ‘13’ and lost form on the tenth squat, otherwise I hung onto it for each set of reps meaning (a) I didn’t have to keep power cleaning to get it back to front squat position (b) I was able to get a nice rhythm in the squats which made it much easier to focus on form and keeping my elbows up. Bruises: four on my collarbones and a random one on my left forearm which I don’t remember getting! That’s five this week and I still have box jump practice on Friday – that’s usually good for a bruise if not an actual shin tear – sometimes it’s miserable to have poor proprioception. 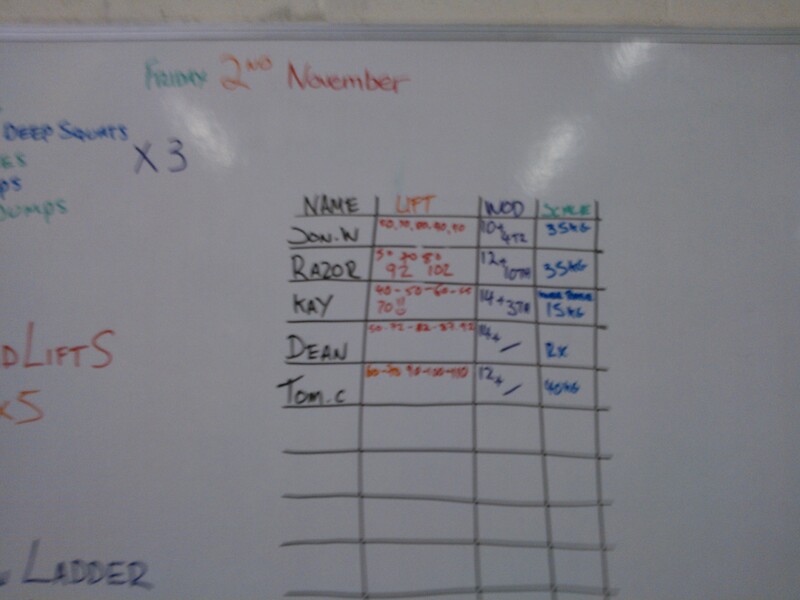 PB: 25 kilos for the power clean x 3 (but my form was appalling for the last one). Wishlist: Just one strict pull-up before Christmas, please! Also a pull-up bar we can install in the house: all the ones I’ve seen don’t fit our 1930s cornice-style door-frames. Posted in Crossfit, crossfit problems, Crossfit women, Lifting, proprioception, WOD and tagged crossfit, front squat, power clean, pull-ups. Bookmark the permalink. They turned up in the lunchtime post – awesome! Posted in Crossfit clothing, Crossfit women, Running and tagged inov8s. Bookmark the permalink. So, I upped my training package to unlimited and immediately fell off a cliff! What I discovered was that adding in just one training session felt like I was back to the beginning with the aches and DOMS and that while I am definitely improving in remembering sequencing, my lifting gains have become miniscule. Coach David wrote a post about plateauing, and that’s what I’ve done. All the big showy gains (like adding 17.5 kilos to my one rep max deadlift, then a couple of days later adding five kilos and making it a five rep max) are over. Now I’m lucky to get another 2.5 kilos onto the bar and get the bar where it needs to be. 1. My recovery time has halved in the past couple of months. 2. The long term injury that stopped me distance running is still there, but with good physio, good warm-ups and a sensible pain management programme, it’s not stopping me doing anything I want to do (as long as what I want to do doesn’t exceed five miles, that seems to be the crunch point for my ITB syndrome). 3. I have put on four kilos of muscle, gone up a size in tops, down a size in trousers and everybody says I look great. 4. I sleep like a log dosed with Valium. 5. I’ve finally given up wheat and no longer have a whole range of nasty symptoms of food intolerance. 6. I love Crossfit, even when I hate it. 7. I could actually benchpress an extremely small and docile bear. So what is it that makes me feel I’m not doing it right?Or well enough? It’s that I’m not a natural Crossfitter – I didn’t start doing it because I liked the idea, I started because there was nothing else left for me to try. I didn’t expect to be good at it, and I’m not. Illusions – that’s the problem. I fall into thinking that those people on TV: The World’s Strongest Man, the Olympic Gymnasts, the elite Marathon runners – are like me. They aren’t. Because we do some of the same things, doesn’t make us the same kind of people, but I want to believe we are. I discredit my little gains because they would be insignificant to a ‘real’ athlete, but I’m real and I’m trying to be an athlete and if I think my gains don’t count, I’ll end up talking myself right out of the door. It was evil. I got timed out with 86 out of 150 ball slams on a 25 minute time cap. Skips instead of double-unders for me. DUs are on my to-do list …But I was happy with my performance, the mile run tested my leg and while it was pretty uncomfortable during the run, but today I’m not having any kind of serious pain, which is fantastic. Bruises: one on my collarbone from front squats, one on my posterior from sit-ups. Wishlist: my new innov8 running shoes to arrive; to get a pull-up before Christmas. Posted in Crossfit, crossfit problems, Crossfit women, Lifting, Why I do Crossfit, WOD and tagged ball slams, iliotibial band, innov8s, running, sit-ups. Bookmark the permalink. .. and I just can’t hide it! With apologies to the Pointer Sisters, I finally had my Crossfit breakthrough and it happened twice in the same wod. Yup, after 21 weeks of two wods a week, daily practice at home, and sometimes Open Gym sessions too, I learned and performed a new lifting sequence the first time of asking. Let me say that again. The First Time Of Asking! It was like a miracle. Twice. 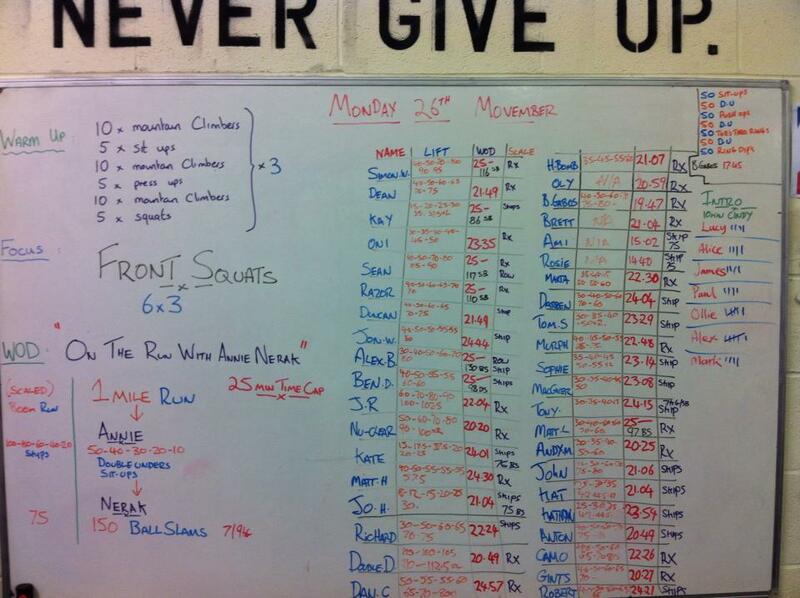 The first sequence was our focus for the day: two squat cleans and one split jerk. I hadn’t done split jerks before and Coach George came over and stood parallel to me as he talked me through it (I don’t learn by seeing and I love the way my coaches help me to write a script for a new movement) and I did it! Okay, my chest was too low, my back foot turned out and my dip did not convert into a drive so I pressed the bar rather than getting it to fly but the point is I didn’t forget the sequence. And I did it again. And again. And again. 7 sets. And not once did I have to stop and close my eyes and run through the script in my mind. It was awesome! Then the wod. Burpee Bar Hops and Bear Complex lifting on a 1-10 and 10-1 ladder. That meant one Burpee Bar Hop and ten Bear Complexes, then two Burpee Bar Hops and nine Bear Complexes right down to ten Burpees and one Bear. The Bear Complex was: power clean – front squat – push press – back squat – push press = one rep. Now I knew I wasn’t going to be able to do that with any weight at all, so I went to a 12k bar with just 2.5k of plates, and hoped for the best. And to my amazement I managed to perform the wod right down to nine Burpees – the timer went before I could do the two Bear Complexes, so I didn’t get to the end of the ladder but I managed that complicated set of lifts, over and over again, and I only had to stop twice in the whole wod to run through the sequence script in my head. I actually had to walk to the wall and slide down it at the end of the hour, because I knew if I lay down flat I wouldn’t have the arm strength to get up again, but I felt like I was walking on air. You see I was never really sure I could create a new neural pathway for such intense exercise at such speed. At fifty it’s increasingly difficult to make new neural nets and when you have had traumatic brain damage in early life, the tendency for the brain to slip into old pathways is intensified even beyond the difficulty most people have in learning new things as they age. I was giving myself six months to establish if there was any hope of me developing new skills, especially in balance and coordination which have always been substantial problems. It didn’t take that long, and I owe the speed of my learning to my excellent coaches and other Crossfitters at Reebok Crossfit Connect Hove who have been tireless in talking me through things they find easy: in particular, Marta for foot positions in lifts and Oni for endlessly helping me remember what comes next, also James for suggesting some alternative approaches to pull-up mechanics and Kelly for endless encouragement during my lowest three weeks. Yesterday was different. I accept that I may not achieve such fluency again for a long time. I acknowledge that my progress, compared to most, is slow and painfully awkward. I know that I will be relying on other people’s patience and tolerance forever – because a klutz is a klutz is a klutz, but yesterday I really felt like a Crossfitter – and it was great! Posted in Crossfit, Crossfit women, proprioception, WOD and tagged bear complex, burpee bar hops, neural pathways, split jerk, squat clean. Bookmark the permalink. 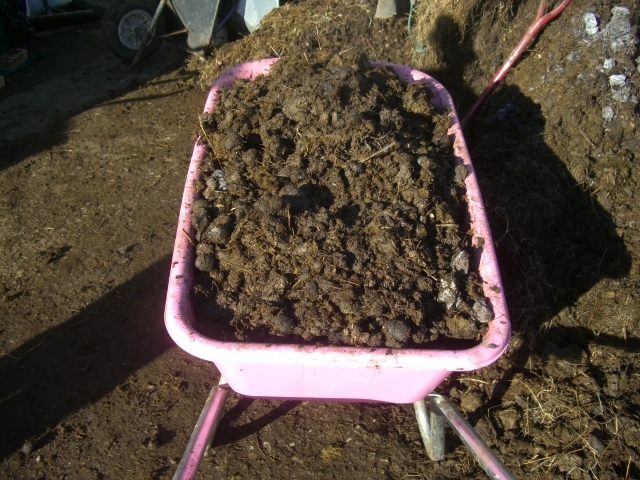 Instead one asks if I’ll come and help him load his barrow because he’s got a weak back! Posted in Crossfit women, Why I do Crossfit and tagged deadlift, farmer's walk. Bookmark the permalink. So, after ten days away from Crossfit, in Florida—where the average person is somewhat larger than me and nobody drives anywhere or eats clean, with the final one and a half of those days being spent alternately throwing up and asleep as the result of a mystery stomach bug—I was not looking forward to my first day back. Even worse, the day I was going to train at Crossfit St Pete was the day I got the vomiting bug, so my one attempt to train in the USA came to nothing. This morning, after a dismal performance at the push press (22.5 kilos, what is that? I just had nothing to bring at all, couldn’t even get my arms to lock out at 25k) I was truly dreading Death by Plate. But somehow I managed to rack up a reasonable performance, in the mid-range of the group, which made me very happy given the whole jetlag/throwing up handicapping added to my ‘normal’ handicapping. The wod is evil – it’s a twenty minute cap and in the first minute you do one of each exercise, in the second minute you do two of each, third minute three etc until you can’t get them all done in the minute. Then rest for a single minute and start working back down from the highest number you achieved (not the one you failed to achieve, which for me was eight) so my score was seven, and I was glad to get it without puking. It was amazing to see so many people at the 7am class – eleven of us! And for the first time that I can recall, girls outnumbered guys. Usually the morning class is boy-heavy (if you take my meaning) while the evening classes are more girl-predominant but this morning there were more of us than them! 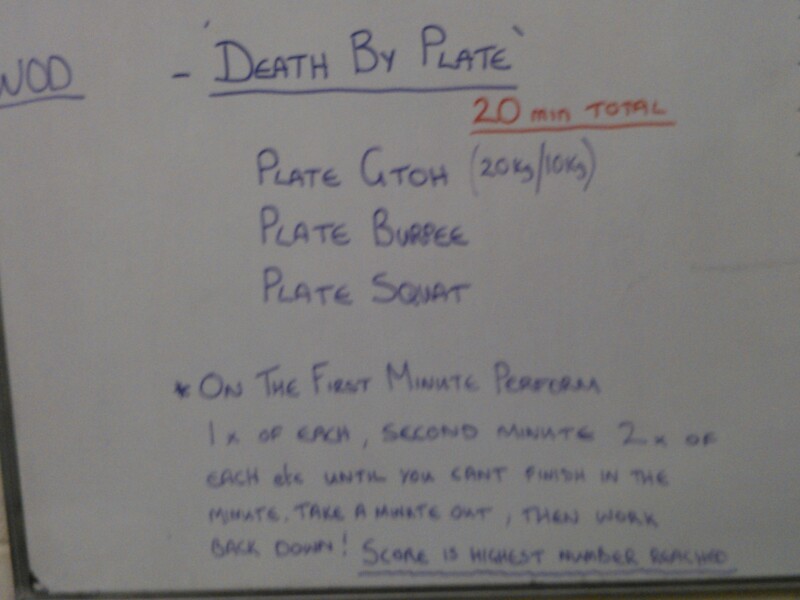 Posted in Crossfit, Crossfit women, WOD and tagged crossfit st pete, death by ..., push press. Bookmark the permalink. Well the coaches and elite athletes from Reebok Crossfit Connect Hove are all at Divided We Fall, Swansea, smashing wods! It’s great to be following their progress on Facebook. 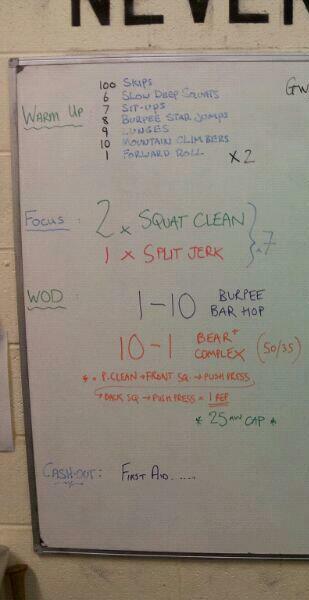 Meantime I have yesterday’s wod to look back on. 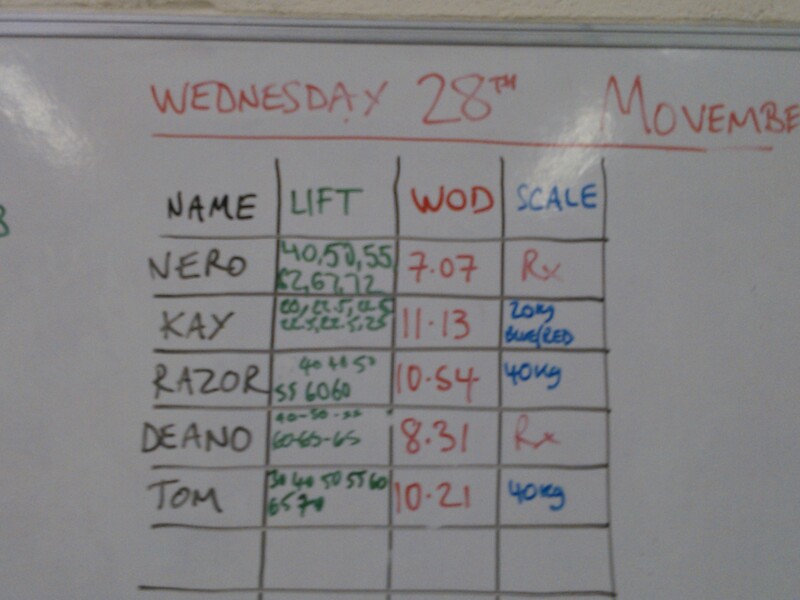 The focus was deadlifts and I managed a PB of 70 kilos x 5. That’s 5k above my previous 1 rep max! As coach Barney said, the last rep wasn’t pretty but who cares – I did it. My current bodyweight is 56k so this is well over my own weight and only 5k short of me being able to deadlift my six foot two inch tall husband! Then a ladder of thrusters and toes to bar for the others, thrusters and knee raises for me: 2, 4, 6, 8, … etc – as far as possible in 12 minutes. I was pleased to get through on a 15 kilo bar, a first for me, as previously I’ve scaled to 12k, and I got to 14 and three thrusters before our time was up. 7am training is working well for me, and I seem to be making steady progress. Posted in Crossfit, Crossfit women, WOD and tagged 1 rep max, deadlifts, thruster ladder. Bookmark the permalink.